The ultra-comfortable and stylish Armband is a smart and versatile solution for people on the active life. Now you can carry your iPod Nano 7th Generation anywhere all while being protected from scratches, dents, and cosmetic damages. The band offers a sleek design while a comfortable adjustable strap that provides for a universal fit. The clear cover provides convenient access to the touch screen and an integrated key pocket that can hold your gym key. 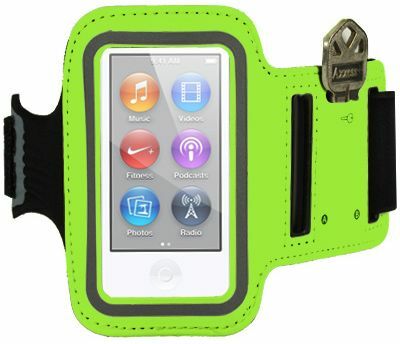 The Sport Armband for your iPod Nano 7th Generation is the secure and convenient way to listen to your tunes while your burning the calories away!. Perfect companion while you run, ride and lift. Transparent screen shield that covers the entire front of iPod Nano 7th Generation without hindering naviation.